This meant that anyone with a computer can see where a purchase is going to be made and for how much. So if you have a faster connection (and several exchanges where you can sell a few shares of a stock, you can already see how you can make money.) Sure, you won’t make a lot of money from any one trade. Maybe less than half a cent here and half a cent there. But that adds up. I know this from first-hand experience. The other day at work, I was trying to calculate what would the cost be of a service was excluded from a package of services. And my calculation kept being almost a billion off. I did it and re-did and re-did it every which way I could think of. I even pulled down my stats book to see if my math was off. Nothing. I got up and went for a cup of coffee just to take a break from this ridiculous problem and when I sat down again, I saw it. It was a rounding error. To be exact it was a rounding error in the one/thousandth decimal place. But I was dealing with billions of dollars and that rounding error made quite a difference. So yes, parts of pennies add up. But wait, there’s more. The way the best price is computed is when an exchange computes all the bids and offers on a particular stock. This computation is done by a government computer and if you know one thing about government, you will know that it takes years to upgrade computers. That means that if you have your own, faster computer you can “front-run” the official best price and sell and buy 100s of shares at the “real” best price. Sure it will be a “rounding error” but as I said before, those rounding errors matter. So a rule that was intended to create equity and transparency in the market in fact institutionalized inequality between the traders who had access to the super-fast computers and those who did not. Only the former would make money from these rounding errors. But wait, there is yet more. To make full use of Reg NMS you also need many different exchanges or dark pools and dark cables. And guess what, both exist. Dark cables are cables that are optimized for speed of transaction. Sure it’s a millisecond difference or even less but in that time you can get a lot of rounding errors. Dark pools are, in essence, proprietary exchanges. They exist to make it easier for institutional investors (like the folks to whom you entrust your pension and mortgage, for example) to trade in large blocks. So, for example if you have one million shares of Microsoft you want to sell (or buy) but don’t want your identity known, you would rather sell/buy those shares away from the glaring eye of the public transaction. Here’s the problem, if your are a high frequency trader, you (by definition) have a super-fast computer and access to dark cables. That means you can “ping” the many, many dark pools that have been set up. By some estimates, 40% of all trading is now done inside dark pools. And that in turn means you can know, well before the government-issued slow computers have finished calculating the best price what the real selling price is. That’s one heck of a rounding error in your pocket. And finally, to make all this work, you need volatility. All volatility means is that the price of something moves up and down a lot. And obviously if it does that, there is a lot more room for a high-frequency trader to essentially insert him/herself in the middle of that trade. Basically here’s the way it works. You want to buy those 10,000 shares of Microsoft for $30. There’s a dark pool that will sell 100 of them to you for that price. I, as a high-frequency trader, ping that dark pool, know what the price you’re willing to buy for is and all the other prices out there and where you will buy from next. So I go and buy the next batch of Microsoft shares that are selling (as you will recall at $30.01). Now, your broker, by law, has to come and buy the shares from me. Except I sell the shares now at $30.1001. And right there, in less than the blink of an eye I have made almost $10. And that’s from a mere 9,900 shares—a small trade. So what high-frequency traders do in effect is charge a tax for trading. And that tax (like most taxes) makes economic activity, in this case people’s willingness to trade to decrease. It also means that flash crashes, caused when a front-running computer algorithm gets too clever by half, are inevitable. 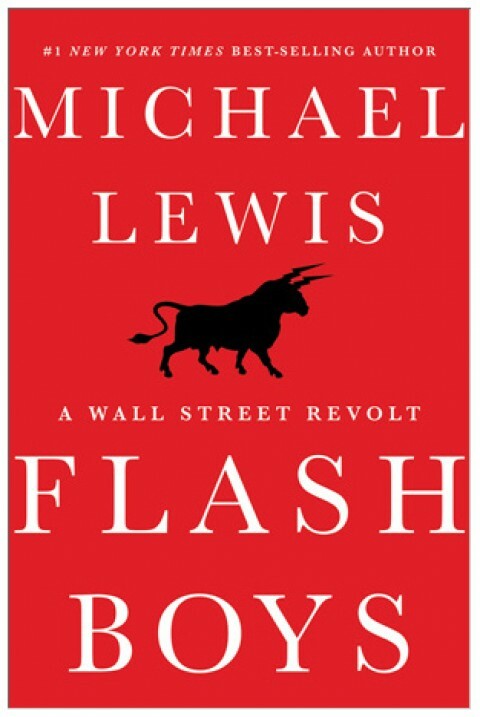 In Flash Boys, Lewis explains all of this a little at a time. In some ways, the book reads like a great detective story. And like a great detective story, it is eminently readable because at its heart is a kind of hero: Brad Katsuyama. Brad sets out to hire a lot of computer programmers to beat the system. First he introduced Thor. This was a platform that enabled you to trade more slowly and then a brand new exchange called IEX (an exchange—and yes, it got the license to be an actual exchange) that did the same thing. The idea behind Thor and IEX seems counter-intuitive but in a high-frequency world it works. If you trade many thousands of shares per trade, then it makes sense that your order should arrive at all the exchanges/dark pools at the same time. That way no-one can ping/front-run you. You will not, in other words, be paying a tax on your trade. So to get the high-frequency traders out of the loop, you need to trade just slowly enough that your orders arrive at all exchanges at the same time. This is the story of how Brad and the motley crew he gathered around him came up with that idea, the push-back they initially got from the industry and how they eventually sold the industry, including Goldman Sachs, on the concept. It is a story well worth reading. I highly recommend it. An eye-opening look at our financial system that reads like a detective story. I couldn’t put it down.